The rabbit hole was deeper than I thought. Turns out not only was I suffering from a virus, but also writer’s block. Maybe not for the typical reasons … it wasn’t because I didn’t have anything to say (fat chance of that). No, I had lots going on in my brain, but just didn’t know if I should be writing about it. I wasn’t feeling inspirational, anything but. A big part of it did have to do with being sick for three plus weeks, finding myself abruptly removed from my wonderful yoga experience, and I might have been okay with only that. But to add, a dear friend shared her troubles with me, which left me feeling oh so sad. AND I began to stress about my job, or more accurate, the upcoming lack of my job. AND even though I’m excited to move on, I’m starting to feel emotional about the end of my time at Virgin America. AND I found myself needing to start planning my upcoming Karma class, and not being able to formulate even ONE SINGLE IDEA ABOUT IT. Can you say BLOCKED, Mister Rogers? (Youngsters, look him up if you don’t’ understand my jest.) AND another friend is having a very serious surgery. Perhaps with my normal energy, I might have done a better job fending off feeling so down. But feeling physically below par, these emotional issues have gotten the better of me. My son called yesterday (have I told you how much I love my kids?) He wanted to tell me how much he liked my post about Ron. My son was far too young to ever remember Ron, but from my stories, he holds him close at heart. It’s ever so cool when your son calls to tell you how much he liked your latest post, or when your daughter wants to throw you a party to celebrate your blog and the end of the class, there really are no words, only tears of love. A few of his counselors had just let him know they would not be able to commit to this summer, so he was bummed out. Not only because it makes it harder for him as the director, but because his buds would not be part of this summer’s experience. We chatted for a while about the situation, but while we both could commiserate about his frustration, in the end we had to agree that a summer commitment has to take a back seat when a substantial employment opportunity comes along. As we came to the end of discussing his issues, I shared that I too was feeling down. I told him that while I loved that he enjoyed one of my last posts, I was feeling so blocked, and that I hadn’t been able to write in a week. That the only thoughts coming into my mind were things I didn’t’ want to write about, and that I was feeling sad. I heard his words almost in slow motion. He was right. It was time to face what was stirring in my heart. I didn’t come this far to drop out. As my son related this story to me, it made me both cringe and smile. He had learned well from his mother, even if I never intended that lesson. It made me a little sad that he considered surrendering his happiness in the moment fearing that it would end soon. In the seconds that our conversation took place, I listened and put his words to a picture, and found a new horizon that I might direct him to, along with myself. As I said the words, they rung true to me. Life returns to center when I can wash away the illusions for myself, and if I can pass along the lesson so that maybe my kids will grasp it a little sooner or easier than I did, that is all I can wish for. Shouldn’t we embrace our joys when they present themselves? They will be gone soon, and more will follow for sure in time, but why would we waste any blessing thinking about the future? Our highs present themselves as a passing sunset. As I said to Jordan, don’t look for the sunset to fade, know it will, which is all the more reason to enjoy when the sun shines so brightly for every single moment that it does shine. I think that perhaps one of our lessons in life is to develop faith in the knowledge that when we relinquish one blessing, there will be a million more to follow. This is one post of probably two or three … dam has broken, lots to say. 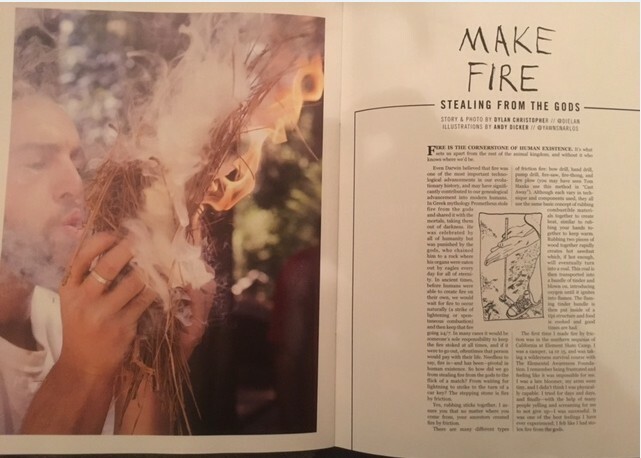 Cover picture is of my son making fire, from an article called “Make Fire,” in the magazine Stay Wild. I think the picture is apropos as he helped create a fire beneath me to get on with my writing, even if I wasn’t finding it easy. I never tire of watching him make fire. Have seen it for many summers now, and every time I see it anew, it still holds such a fascination for me. Basic elements … when we break life down, the most important things are just that, basic. Family, health, fire, warmth, food (and yes, Clay) God. Thanks my friend. You are correct the only sure thing is change. But the only thing that doesn’t is God and that is so comforting. Lvya Sue glad you are back on track. Just thinking, you could always write and not post it until you’re truly ready to post it. Or just write for yourself and not post it at all. Maybe I’m making it sound simpler than it is but just thinking here.